A Boston Marathon survivor wrote a breakup letter to her leg. "Sorry leg, it's not you, it's me. And you've got to go." 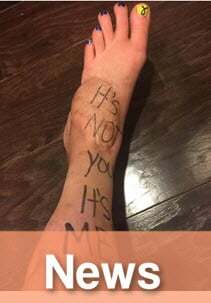 Boston Marathon bombings survivor Rebekah Gregory DiMartino recently wrote a moving but seriously funny “breakup letter” for her soon-to-be-amputated leg. The 27-year-old survived the 2013 bombings but recently decided to amputate her left leg below the knee after enduring more than 15 operations and 18 months of therapy. 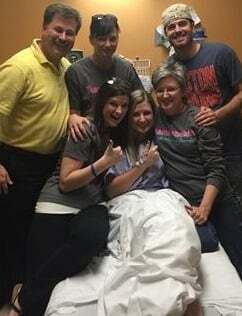 The young Texan mother was determined to stay positive and she approached her surgery date by posting the “breakup letter” on Facebook. 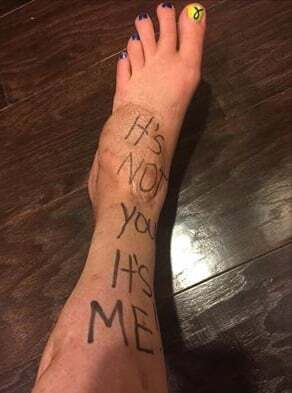 She also treated her foot to one last pedicure and scrawled the words: “It’s not you, it’s me” on her badly damaged leg. The letter is touching, but it is also funny – so it is not surprising that it’s gone viral and attracted fans and supporters from across the globe who have been inspired by the way Rebekah has handled the situation with courage, grace and a wicked sense of humour. I’m sure it won’t come as a shock to you when I say that we’ve grown apart. The love that we once had has dwindled, and this relationship has become a real burden on my life. We have been through a lot together. We have seen a lot of places, done a lot of things, and you have helped me through some of the toughest steps thus far. I promise to always treasure that. And I’m not saying this isn’t hard for me. It is. But as tough as it may be, I feel like our time together has come to an end. I need to feel every day that by having a relationship with you, I am becoming a better person. And for a long while now, I haven’t felt like that. Instead, I feel like you are holding me back from really reaching my full potential. Now I get this is probably pretty tough to hear me say, but I have never lied to you and I don’t plan to start now. What I need is something you can’t give me anymore. And the empathy that you require, I can no longer handle. I love you. I really do. But I think I need to start on the next leg of my journey. So with that said, I have enclosed a gift certificate that I hope you will use. Go get yourself one last pedicure on me and enjoy it because tomorrow…I will be cutting you out of my life for good. Supported by her husband Peter and son Noah, 7, Rebekah has recovered well and has kept up her remarkably upbeat attitude. The bombings killed three people and injured more than 260, and Rebekah is the 17th person injured in the bombing to lose a leg, according to The Washington Post. Bombing suspect Dzhokhar Tsarnaev has pleaded not guilty and will go on trial in January, while his older brother, Tamerlan, was killed in a shootout with police after the blasts. 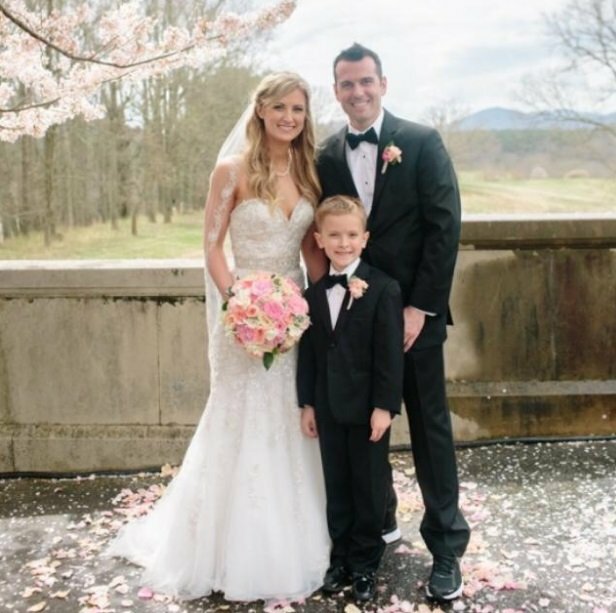 Good luck to you, Rebekah..
Rebekah, Peter and Noah on the couple’s wedding day.